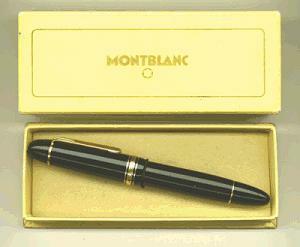 The Montblanc 149 Masterpiece must be one of the most widely recognized fountain pens around. Produced continuously since 1952 and likely to remain in production as long as Montblanc exists, the 149 has changed little in external appearance over the years. Nonetheless, there are significant differences between new and old examples, with pre-1962 pens being the most desirable. The most obvious external difference is the wide gold-filled central cap band flanked by narrow bands in sterling silver (see detail right) instead of the three gold-plated bands used later. Internally, the earlier 149s have the heavy brass two-stage filling mechanism of the type first used in top-line Montblancs of the '30s and '40s. The overall heft of the earlier pens is significantly greater than the later injection-molded plastic models; the celluloid of the earlier pens also has a different and warmer feel. The barrel's ink window has an amber cast, while the star emblem is ivory in color, rather than pure white. For many years vintage 149s weren't terribly expensive -- probably because of their superficial resemblance to their modern descendents, which havebecome so ubiquitous as to have lost much of their cachet among diehard pen enthusiasts. In the last fifteen years, however, prices have gone up considerably; nonetheless, early 149s still sell for less than their mechanically-identical flat-topped predecessors.